Fantastic camera deals available on Amazon right now. Now that Black Friday is over Amazon has a series of Cyber Monday camera deals live on its site. There are a whole host of offers that are ripe for photographers, including some serious savings on Sony cameras thanks to terrific cashback deals. UPDATE: Cyber Monday is here and we have updated this page with all the best camera deals. We will be updating throughout the day, so please keep checking back. We're seeing some very impressive photography offers right now. For more great discounts across all the retailers, head to our Cyber Monday camera deals page – where you'll find some stunning savings. Don't forget, if you have Amazon Prime, you'll be shown Lightning deals 30 minutes before everyone else. This is where we often see some of the best deals, and that 30 minutes can be the difference between scoring a ridiculous saving on some photography gear, and missing out. 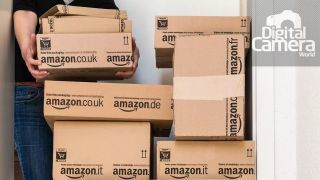 The good news is, if you don't want to fully commit to a Prime subscription, you can sign up for a free 30-day Amazon Prime trial – and still get access to the Cyber Monday Lightening deals on camera equipment. You can then cancel any time before the 30 days is up, with no strings attached. GorillaPods are brilliantly, adaptable, portable, miniature tripods that enable you to attach or set up your camera virtually anywhere. And, if you're a vlogger, it makes a "Casey Neistat grip" to film in selfie mode. The 3K is suitable for camera/lens combos up to 3kg in weight.